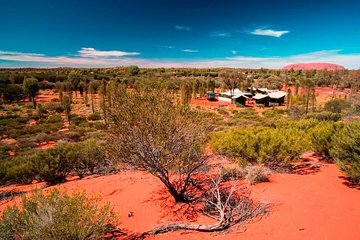 Descubra la belleza del Centro Rojo de Australia en un tour de 2 días en el Parque Nacional Uluru-Kata Tjuta, declarado Patrimonio de la Humanidad. Comienza desde Alice Springs o Ayers Rock, luego viaja con tu guía a Uluru y Kata Tjuta, donde paseas, escuchas historias de la cultura aborigen y observas el amanecer y el atardecer sobre Uluru. Acampe durante la noche en el parque nacional, durmiendo bajo las estrellas. Un recorrido ideal si tiene tiempo limitado, este tour para grupos pequeños ofrece una experiencia íntima en uno de los sitios más emblemáticos de Australia. Uluru y Kata Tjuta, tour nocturno de grupos pequeños desde Alice Springs o Ayers Rock. Visita el Centro Cultural y aprende sobre la ley y las creencias aborígenes. Descubre los misterios de Uluru en una base guiada. El tour en grupos pequeños asegura una experiencia más personalizada. Su recorrido de 2 días por el Parque Nacional de Uluru-Kata Tjuta, declarado Patrimonio de la Humanidad, comienza con la recogida en Alice Springs o en el aeropuerto de Ayers Rock y viaja a Uluru el primer día, y a Kata Tjuta el segundo día. Duerma toda la noche en un campamento ubicado dentro del parque nacional y comparta una cena cocinada en la fogata. Los alojamientos para acampar son básicos pero cómodos, y consisten en una carpa permanente o un botín, el término Outback para una petaca, que contiene un colchón, una sábana y una almohada. Experimente el atardecer y el amanecer en Uluru, y disfrute de caminatas guiadas tanto en Uluru como en Kata Tjuta, con comentarios informativos sobre la cultura y las tradiciones aborígenes, especialmente en relación con este lugar sagrado. Partiendo de Alice Springs, temprano y brillante, salimos a la carretera en nuestra aventura de nuestra vida. (Para aquellos que comiencen el recorrido en Uluru, lo recogeremos del Outback Pioneer Hotel o lo recibiremos de su vuelo en el aeropuerto). Nuestro viaje comienza en dirección al sur hacia Erldunda, viajando a través de Waterhouse y James Ranges, con una parada en Camel Farm para tomar un refrigerio y un paseo en camello si está interesado (por su propia cuenta). Nos detendremos en Mount Ebenezer Roadhouse donde podrá ver o comprar artefactos aborígenes. En el camino a Uluru, nos detendremos para ver Atila (Monte Connor), una meseta de mesa y la primera formación de roca significativa de nuestro viaje. Experimente los famosos colores cambiantes de Uluru al atardecer, con vino espumoso y bocados. Es un buen momento para descansar y contemplar el día y la inmensidad del desierto. Después, instálese en nuestro remoto campamento privado, con nuestra exclusiva experiencia gastronómica Endless Star, antes de retirarse a su botín bajo el increíble cielo nocturno o su cómoda tienda de safari con camas. Al levantarse temprano, dé un paseo por un mirador cerca de nuestro campamento para ver la salida del sol sobre Uluru y Kata Tjuta sin el ajetreo y el bullicio de las áreas de visualización públicas antes de dirigirse a Kata Tjuta, una palabra aborigen que significa “muchas cabezas” y una caminata. a través del "Valle de los Vientos" para explorar sus cúpulas de las cuales hay 36 en total. Caminamos a través de lechos de riachuelos, cúpulas y hermosa naturaleza salvaje. Después de la transferencia de regreso a Ayers Rock Resort, su experiencia en Red Center llega a su fin. Our guide was very knowledgeable. The trip was very busy and quick. I'm an active 68 year old and the hike was more than a moderate hike. I couldn't finish. I had booked an overnight at Uluru and had inflatable mattress sleeping bag etc ready in my bag. For some reason officially : Truck problem pure lie I was put in another group I found at the airport the group which was going to sleep under the stars was average much younger than me, I was put in a group of people ranging from 30 to probably 55-60, I am 73 but I have been trekking 12 days in Sahara Desert two years ago 2015 and many times all along my life. So, the difference of age was not a problem for me, but was probably one for the Tour Operator. So we did nor sleep next to Uluru in the bush, but in pre-installed square cabins some 20 km from the Rock, with a kitchentoilets block. Everything was nice, but I removed one star from my review because of missing this open-air night I was expecting against 12 nights in the sand / rocks in Algeria Desert near Libyan border !!!. Everything you need @ Uluru! We got to see Uluru and Kata Tjuta during the tours. Both were impressive to see up close, Uluru is massive, and Kata-Tjuta had a lot of different terrain to climb/hike through and see. Tour Guide Annabelle was very knowledgeable about the history, geology, flora/fauna, with a number of great stories. Food was good, nothing special but you're camping. Tents were solid along with the cots or you could sleep outside in a SWAG!. Sunrise/sunset views are contingent on weather but you're in the best spot to see them. All around ticks the boxes! We had a great time. We felt like we learned a lot about the culture surrounding Uluru. Got to walk around a lot, watch the sunset and sunrise. We also enjoyed sleeping in the swags and enjoying the stars. Food was great, bathroom facilities were great as well. Tour guides were very knowledgeable and friendly. Would definitely recommend to others. We only wish we could have stayed longer and done the longer tour. There was nothing particularly wrong with this tour, but nor was there sufficient value-add to make it worthwhile. Maybe if you are touring from Alice Springs and want to meet other travellers it is OK, but I was based at Yulara and could just as easily have visited the Rock and the cultural centre, walked around the base and viewed the sunset and sunrise on my own. Others have said their guide was wonderfully knowledgeable and engaging - maybe ours had just done it too many times to be interesting, or maybe I was just not tuned in to the very laid back Territorian way of communicating. J'ai beaucoup aimé l'expérience. Dormir dans le désert, c'est une expérience à vivre. J'ai aussi bien aimé les commentaires du guide lors de l'excursion à Uluru et Kata Tjuta. Nous sommes arrivés bien juste pour le coucher du soleil. Le repas du soir était bien, agréablement surprise. Der Trip war eine super Erfahrung. Wir fanden es großartig. Unser Guide Anabell von Wayoutback hat einen ganz tollen Job gemacht, Sie hat uns soo viel erzählen und erklären können und das nicht als educator, sondern so, dass es einfach Spaß gemacht hat. Great small group tour if you're short on time and want to camp! I highly recommend camping, it's perfect! Despite some poor quality tents the trip was really very very good. It all boikled down to one of the best guides/hosts we have experienced over the years Timi. He is very respectful towards the clents, the aboriginal culture and the flora and fauna. He takes the time to engage his group in starting to understand the values of respect for all and makes it with a smile and winning way. A great trip. Jules the tour leader is a very knowledgable guy who was able to explain all the history and folklore of the indigenous people of the Uluru area. The big problem during the travel was the PA System in the Convered Truck being used as a 'bus' not up to the job. 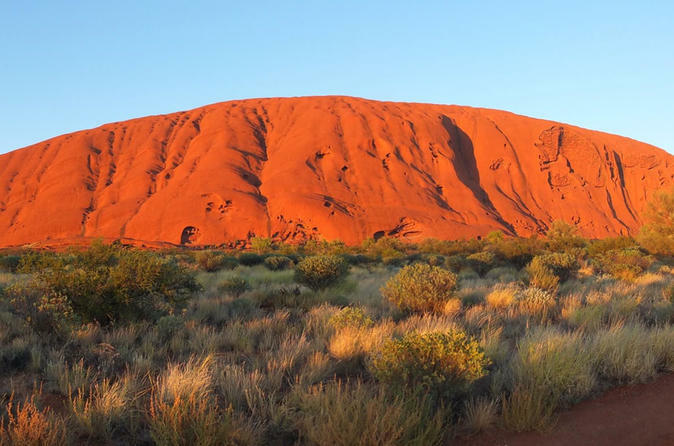 Uluru is magnificent and well worth the trip to get to see it at sundown and dawn. However the cheap plastic toothbrush holder cups for the bubbly when all around have champagne flutes signals the cheapness of this trip. Getting up at 4.30am is not a problem when the camp, that you stay at, is so basic. Having no lights to even get to the tents, or to get changed by, is not good. This is such a basic amenity to provide? The swag is not as warm as Jules suggests in the middle of winter! The 'guests' paying customers are expected to do all the cleaning up and even cooking their own lunches. So if you expect Glamping then this is not for you.